“Raja Ampat is the best diving spot you’ll ever see..” my friend said to me once. That’s pretty much the conversation with so many of my friends before we head out to Raja Ampat earlier this year. I mean, I’m not really a scuba diving guy, I can do snorkelling but very limited. So when we were thinking about heading out to this place, it’s kind of very daunting for us. But just like any other great adventure stories, we just go and see what’s up. We had a rough start for this trip. Our flight was delayed. Well, technically it wasn’t, yet because of the crazy air traffic in Jakarta’s airport, the plane took off 30 mins behind the schedule. We supposed to arrived in Sorong at 1pm and we should board on a ferry to Waisai (which is only twice a day) at 2pm, the latest departure. But because of all the things that happened, we got off the airport at exactly 2pm. The distance to the port was 15 mins, so we arrived there at 2.15ish. And magically the ferry was still there! And we managed to board the ferry just before it departed. That’s it about the rough start. Once we touched down in Waisai, everything feels so much more relax. We stayed in Kakatua Hostel, a small yet modern hostel in town. It is conviniently located to the town market, so it’s quite easy to get foods and supplies for our trip. And the facility there is just so good. I think that this is the best hostel I’ve stayed in. We went around looking for informations from the locals for a more off beaten path destinations around the island. And we got it. Our first destination is Kalibiru or Blue River. A hidden gem in Waigeo Island. 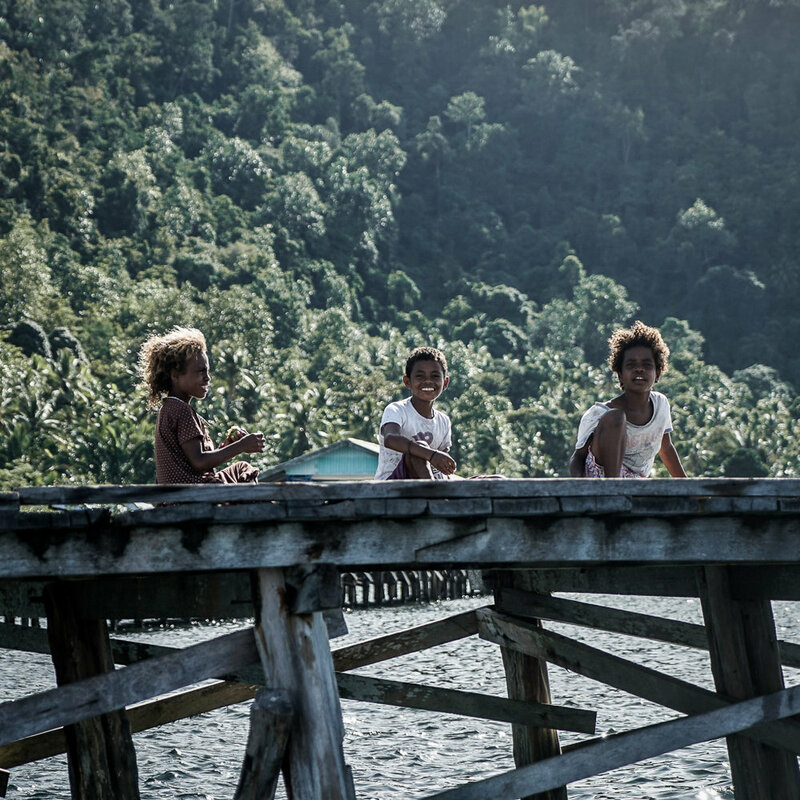 It’s about 1 hour drive from Waisai, during which there was no other car passing by the road, and we stopped by a village in a bay, where we took a few minutes boat ride to the jungle. Then, we walked through some shallow parts of the river, and into the jungle before finally arrived in Kalibiru. They’re all short walks actually, the total walk was less than 30mins, but it felt very pure and isolated, there were only the sounds of birds accompanying our short hike there. In the river, which is sheltered by the thichk rainforest, we can have a little swim around, enjoying the very cold water, and the jungle vibe. We truly didn’t expect this kind of scenery here, but really it was a great experience and a really good and refreshing start after a long journey to reach this place. Our next destination is Mandos birdwatch. It is loacated about 20km from Waisai, an hour drive. Our mission there is to see and hopefully photographed the Birds of Paradise. It won’t be an easy mission though. Once we arrived there, we realized that this place is actually a guesthouse, kind of an eco resort that is being run by the locals. There are some above the water a la maldives rooms, and underneath them is a crystal clear whitesand beach with small fishes swimming around and you can watch an amazing sunset here. unfortunately we didn’y stay there. So, we continue with the birdwatch. We went into the jungle, walked about 1 hour to some spots where the Birds of Paradise normally stop by. The walk was quite challenging, but it was quite manageable. Okay, we saw the birds, there were 2 of them. But unfortunately, didn’t manage to catch them with camera. They don’t usually do this though. Normally, as the guide said, they will stick around for a while while showing off their beautiful colors on the trees. I guess, it wasn’t our day for that. But in the evening, we stayed around for the sunset, and it was just a bliss. Good way to end the day before heading out to the islands the next day. So, finally we’re heading out to a more well known Raja Ampat Adventure. A trip to islands around Pianemo. 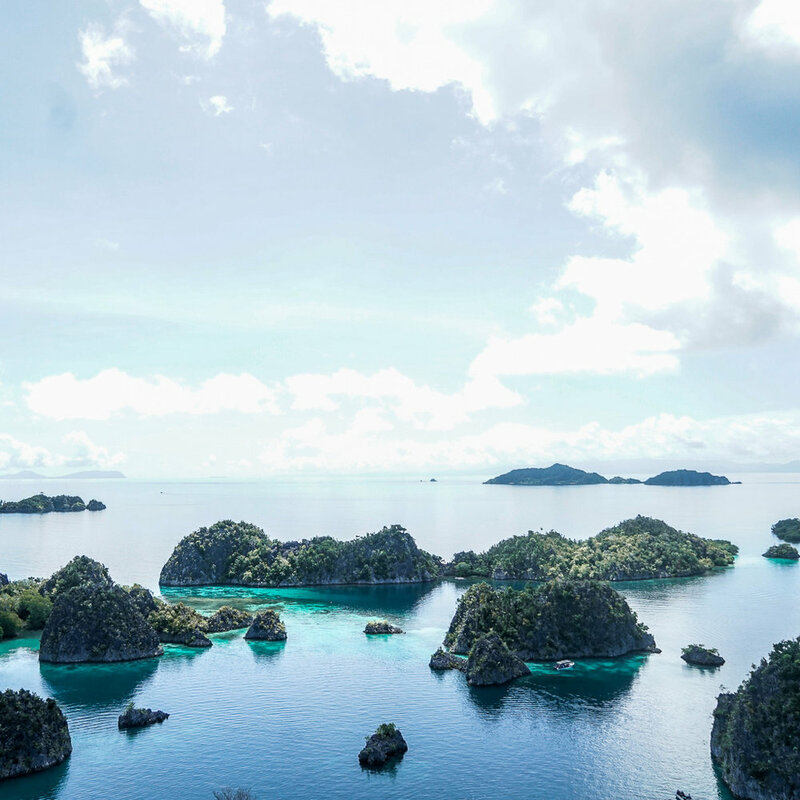 It is the more touristy area of Raja Ampat. Although it wouldn’t get too crazy, sometimes, especially during weekends, it could be quite hectic in here. But it is for a good reason. The area is very easily accessible from Sorong or Waisai, and the view that you get is also fantastic. Just imagine a turqouise ocean with little rock islands all around reef sharks swimming free around the city of colorful corals, and some nice tradtional wooden homestay on the white sand beach. We stopped in some places, first one is Pianemo Island itself, where you can see that iconic Raja Ampat view, then moving on to Teluk Bintang, and the to some snorkelling spots around. Villager kids were always ready to greet us whenever we arrived. It’s always good to always see a little bit of local life while travelling. It has been the ultimate island adventure for me. I know there are just so many beautiful islands in Indonesia, but Raja Ampat has something that made us want to stay longer all the time. Our 5 days there felt very short, and we definitely have an unfinished business that we need to take care of soon. We truly need to come back.